The mummified remains of a woman suspected of having died during childbirth about 350 years ago found at a burial site late last month were examined by a research team Sunday. The woman was wrapped in multi-layered burial clothes, showing the dress and hair fashion of noblewomen during that period. The research team is being led by professor Shin Dong-hun at the anatomy department of Seoul National University's medical college and professor Kim Myeung-ju of Dankook University's medical college. The woman, named Ohn Yang-jeong, was the second wife of Jeong Hee-hyeon, who lived in the middle of the Joseon Kingdom. Jeong's descendants found the remains while relocating their ancestors' burial sites in Hadong, South Gyeongsang Province, late last month. 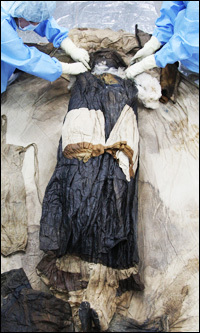 Ohn was wrapped in 46 layers of clothes, under which the team also found a small skull and other bones around the lower part of her body. ``We need more scientific examination, but we believe Ohn died during childbirth and was buried together with the dead baby. A pair of child's pants found beside her feet also shows a link to the death,'' Shin said. He suspected that the woman died young, probably in her 20s or 30s, considering the condition of her teeth and color of her hair. ``Studying the remains presents valuable information about funeral and mourning ceremonies of the Joseon Kingdom (1392-1910) as well as helping further studies about diet, epidemics and parasites of the period,'' Shin said. This is the second time that mummified remains of a female who died during childbirth have been found, following the first one discovered in Gyeonggi Province in 2002. Ohn was about 155 centimeters tall, which was the average height of females of the Joseon era, according to Shin. The clothes found on Ohn were for a funeral, not ordinary dress for daily life. But history and costume experts say that they are valuable as they partly reflect the fashion style of the time. Along with the 46 layers of shrouds, she was wearing shoes made of paper and her hands were wrapped in black cloth. Her 80-centimeters-long hair was braided and she had a ``gache,'' a kind of wig used to give body to the hair. Gache were banned in the middle of 18th century as they represented signs of extravagance.